This all glass solarium in William Caligari’s home is completely heated by the sleek cylindrical stove in the far left corner. Unlikely though it may seem during the current hot weather, winter is coming — and with it, the need for a particular Berkshire warmth. Homeowners who want the comfort and glow of heating by fire — with wood, pellets or natural gas — don’t need to sacrifice interior home aesthetics to awkward, too-common or domineering stove designs. 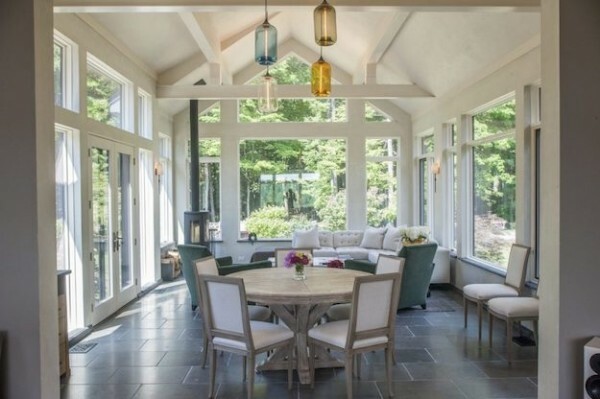 Designing around your source of warmth can add joy and style to a Berkshire winter. Design and engineering are the keys to designing for warmth. Well-designed stoves, situated in thoughtful environments, will make a statement, heat your home, reduce your reliance on fossil fuels and cut down on heating costs. The soapstone stove in the house when my clients bought it. When one of our client couples bought a new home on Stockbridge Bowl in 2016, they were determined to get rid of the stark soapstone-encased wood stove in their new living room. It simply did not fit with their interior design vision — it felt awkward and out of place. 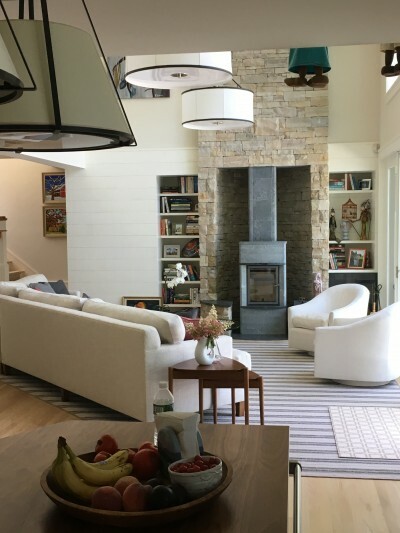 They initially wanted to replace the wood stove with a large-scale fireplace and masonry chimney. But a soapstone wood stove like theirs can be immensely efficient and attractive in the right surroundings, so I was reluctant to tear it out. We generated a concept sketch that incorporated the soapstone stove, and we compared the rather staggering cost difference of building a new fireplace. Our clients were convinced, and with their buy-in we were able to transform the room with the stove as the focal point of their new space. 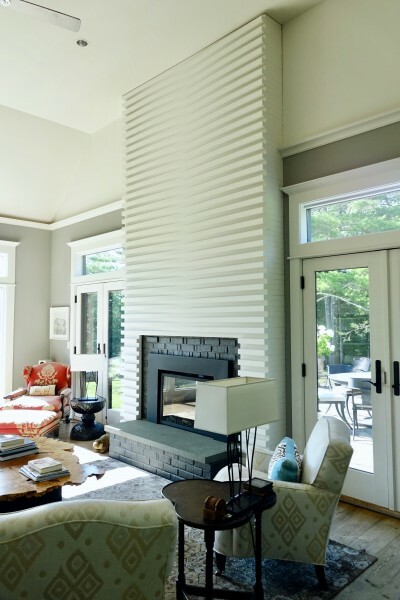 The clients saved thousands of dollars in construction costs by foregoing a new fireplace and chimney, and they now have a more efficient and comfortable winter lifestyle than a fireplace would have offered. 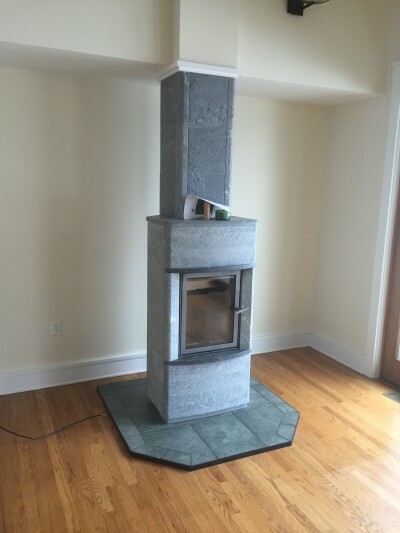 The same soapstone stove as the focal point of the renovated living room. I have brought the benefits of heating by fire into my own house. When my wife and I first viewed what would soon be our home in Sheffield, we saw a living room with a conventional fireplace that had been designed with no sense of aesthetic: it was simply a featured amenity in the real estate listing sheet. It was remarkably inefficient, sucking warm air up the chimney when in use. This is the way the fireplace looked when the Caligaris bought their house. And this is the fireplace as it looks now.As we redesigned, we replaced the small windows on either side with glass doors, and transformed the fireplace into an inviting year-round focal point. We painted the traditional fireplace brickwork black — a great trick I use frequently. We designed a dramatic floor-to-ceiling mantel, drawing on an origami aesthetic, making the most of the room’s height. 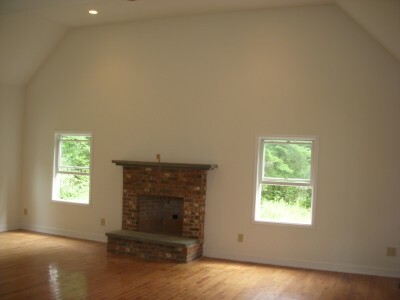 The new design around the fireplace draws in natural light and gives floor-to-ceiling design punch to the entire room. We added energy efficiency by switching the fireplace to gas, which is super-efficient as a supplemental heat source with its push-button, instant fire features. And this is the fireplace as it looks now. In our all-glass solarium, the room height called for an upward stretch. And with floor-to-ceiling lines, we could emphasize–rather than diminish–the strong-statement stovepipe, painted in the same charcoal gray as the stove. We purchased our stove from Morso, which offered traditional and contemporary designs; we picked a sleek cylindrical stove with three sides of glass. Today, there’s nothing like sitting in that room on a brisk January day, looking out at the weather while reading a book on the sofa. It makes us love being here in the dead of winter. We know our Stockbridge clients feel the same.So what has become of our heating bills? We have cut our overall home heating bill by an estimated $1,500 per year — largely because of the super-performing solarium wood stove, which is off in a corner, not central to the house. The separate heating system in that room has never been turned on. We’ve never needed it. So it pays — in more ways than one — to give added attention to winter heating sources that can add both delight to winter and design to your overall interior.